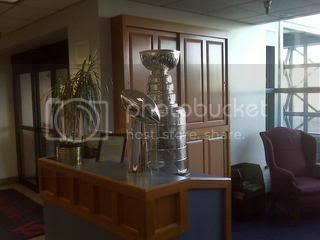 Here's the photo we've all been waiting for: the Stanley Cup and the Lombardi Trophy, united at last. This took place in Harrisburg, where they met up with a third pal, the Phillies' World Series trophy. Yeah, you could definitely say Pennsylvania solidly owns pro sports these days. Wow, It's like a meeting of the Hatfields and McCoys. shame the sixers couldn't get it done!